In its 2011 report, the World Economic Forum identified the Water-Energy-Food (W-E-F) security nexus as one of the greatest threats to the global economy and sustainable development over the next few decades. In order to respond to these challenges, GWSP launched a survey within its Global Catchment Initiative (GCI) that addresses the nexus between water, energy and food in large transboundary basins as a critical issue at the science-policy interface. The Role of Data in Monitoring Change in River Basins. In May 2012, GWSP together with IISD’s Water Innovation Centre organised a conference on water, energy and food security to review the GCI II results and collaborate on findings. The conference on “Water-Energy-Food-Security: New directions for water management” brought together international experts, opinion leaders, policy-makers and scientists to discuss challenges and review ways to foster a sustainable approach to the development of energy and food resources through improved water management practices. The Conference Proceedings (PDF , 4 MB) summaries the discussion and highlights the major findings. 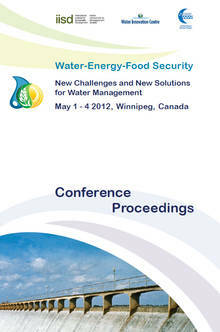 The resulting Policy Recommendations that were developed during the conference as a contribution from the water science community to Rio+20. Conference Presentations: International Institute for Sustainable Development – IISD.